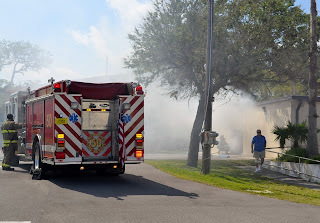 COCOA BEACH, Florida - A structure fire erupted around 11:20 a.m. today at the Our Saviour's Catholic Church located at 5301 North Atlantic Avenue in Cocoa Beach. The building that was set ablaze was a small building adjoining the south side of the Our Saviour's Gym. Initial reports are that the fire was started after a lawn mower caught on fire in the building. Cocoa Beach fire rescue crews arrived and initiated a quick attack. The burning lawn mower was extracted from the building. Fire crews quickly knocked down the fire before 11:40 a.m.
Fire crews remain on scene to mop up the affected area.